Theodora Elisabeth Gerarda "Anky" van Grunsven (born 2 January 1968) is a Dutch dressage champion who is the only rider to record three successive Olympic wins in the same event. Along with her Olympic successes, she has won numerous medals at the World Equestrian Games (WEG), and is the only rider to have competed at every WEG since they began in 1990. Between 1990 and 2006, she competed at the Games in dressage, but in 2010 she was named as part of the Dutch reining team, marking a major change in discipline. In addition to her Olympic and World Equestrian Games successes, van Grunsven holds the record for the most wins at the Dressage World Cup, winning the event nine times between 1995 and 2008. She has also competed numerous times at the European Dressage Championships, winning seven individual medals and eight team medals between 1991 and 2009. Although van Grunsven has ridden many horses over her career, she won the majority of her top events on two horses: Bonfire and Salinero. Bonfire, upon whom she had many of her early successes, was retired in 2002. Salinero quickly took over as van Grunsven's top horse, and remained in that position until his retirement in 2013, after making a major comeback to compete in the 2012 Olympic Games. Van Grunsven has been closely linked with the controversial training method rollkur, although she has moved to distance herself from the practice after it was banned from international competition. Van Grunsven was born in Erp, North Brabant. She began training in dressage at the age of 12, after her horse Prisco (who she would later ride at the Olympics and World Equestrian Games) performed poorly in show jumping. Van Grunsven is married to Dutch national equestrian coach Sjef Janssen, with whom she has two children. She was pregnant with her first child, Yannick, when she competed at the 2004 Olympic Games, and gave birth in November of that year. Van Grunsven and Janssen married in Las Vegas in late 2005, and in March 2007 had her second child, Ava Eden. In 1999, van Grunsven, "frustrated by the lack of fashion in the equestrian world", developed a line of equestrian clothing, now sold internationally. Van Grunsven holds the record for winning the most Olympic medals by an equestrian, with nine medals, and is the only person to have won any equestrian event in three successive Olympics. She is also the only person to compete at seven successive Olympics in dressage. She has competed in every Olympic Games between 1988 and 2012, winning a total of three gold medals, five silvers and one bronze. At the 1988 Summer Olympics, riding Prisco, she was eliminated in the qualifying rounds of the individual dressage, and was the lowest-scoring member of the fifth-place Dutch team, meaning her score was not used to determine the team's standing. At the 1992 Summer Olympics, her performance improved, and riding Bonfire she took fourth individually and won her first silver medal in the team competition. At the 1996 Games, again riding Bonfire, she won double silver in the individual and team dressage competitions. With her last Olympic ride on Bonfire, at the 2000 Summer Olympics, she won her first gold in the individual competition, while helping the Dutch team to their third consecutive silver. In 2004 in Athens, on her new mount, Salinero, she won her second gold in individual competition, while the Dutch team came in fourth. The 2008 Olympic Games, again riding Salinero, brought her her third consecutive individual gold, while the Dutch team returned to the medal podium with a silver. Riding Salinero in 2012 in London, van Grunsven slipped to sixth place individually, but helped the Dutch team to her first bronze medal. Van Grunsven was originally not expected to compete in the 2012 Olympics, as the horse she was riding at the beginning of 2012, IPS Upido, was injured. However, in April, she announced that she planned to compete for a spot on the Dutch Olympic team with the then-18-year-old Salinero, who had staged what the media called a "comeback" after previous injuries. Along with her Olympic successes, van Grunsven has also won numerous medals at the World Equestrian Games. After competing in the 2010 World Equestrian Games, she became the only equestrian to have competed in every World Equestrian Games, which have been held every four years since 1990, and which include three sections of dressage competition, two individual and one team. At the 1990 World Equestrian Games, riding Prisco, she finished 23rd individually. Van Grunsven rode Bonfire at the 1994 and 1998 World Equestrian Games, winning individual gold and team silver at the first and double silver (one individual and one team) at the second. She was unhappy with the judging at the 1998 Games, held in Rome, and said that she "thought [she] would quit dressage", despite her high finish placement. At the 2002 World Equestrian Games, riding Krack C, she finished 11th individually and rode to 5th place with the Dutch team. Her best finish was at the 2006 Games, riding Salinero, where she won an individual gold and two silvers, one individually and one team. At the 2010 Games, after her top horse Salinero was injured and second-best horse Painted Black was sold, she competed as part of the Dutch reining team, marking a major change in discipline. Riding Whizashiningwalla BB, she was eliminated in the qualifying rounds. At the Games, she also performed a reining demonstration at the presentation of the team dressage medal and participated in an exhibition of freestyle reining. Van Grunsven began riding reining horses around 2000, but only became a serious competitor in the sport after the 2008 Olympics. Van Grunsven has won the Dressage World Cup nine times, in 1995, 1996, 1997, 1999, 2000, 2004, 2005, 2006 and 2008. She took second in 1998 and third in 2009. The World Cup features freestyle dressage (also called Kur Grand Prix), and her record number of wins has won van Grunsven the nickname "Queen of the Kur". She has also collected five gold medals, eight silver and two bronze at the European Dressage Championships. At the bi-annual European Championships, there is one team competition and three individual events: Individual Dressage, Kur Grand Prix and Special Grand Prix. Van Grunsven took first in the Individual Dressage portion in 1999 and 2005, and second in 1995 and 1997. In the Kur competition, she took first in 2007 and third in 2009. The Special Grand Prix has historically been her weakest event, only taking second in 2007. 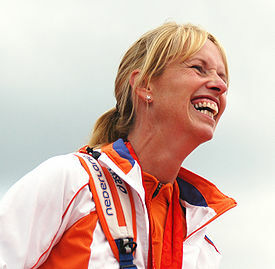 She has taken the greatest number of medals in the team competition, with the Dutch team taking first in 2007 and 2009; second in 1995, 1997, 1999, 2001 and 2005; and third in 1991. In 2002, Bonfire was retired, after a nine-year international career. The pair's gold-medal-winning freestyle dressage performance at the 1994 World Equestrian Games marked the first the time event had been held at the Games, and "changed the world of dressage forever", according to fellow Olympic gold medalist Carl Hester. A statue was erected in Erp to mark Bonfire's achievements. In October 2013, he was euthanized following illness. After Bonfire's retirement, Van Grunsven stated that she never thought she would find another horse as good as he was; however, his successor Salinero proved to be even more successful. In March 2013, Salinero was retired. Van Grunsven and Salinero have been called the "pioneers of the modern freestyle test", and were the first pair to have music written specifically for their performances. A horse known for his power and ability, he was also sensitive and, early in his career, prone to becoming tense, making him a more difficult horse to ride. Despite this, he was a star of the dressage world, winning numerous international competitions. In January 2003, van Grunsven sustained a fracture of a bone in her upper leg in a fall from a horse in training, and required surgery. A metal plate was embedded in her leg to immobilize the bone during the healing process, and van Grunsven recovered, winning the 2003 Dutch Dressage Championships in June. In September, she underwent a second surgery to have the plate removed. In 2004, she became the first Dutch rider to win the CHIO Aachen dressage competition, a top international competition. Van Grunsven was closely linked with the controversial training method rollkur, and advocated use of the method as recently as 2007. She has since moved to distance herself with the method since the International Federation for Equestrian Sports (FEI) declared in February 2010 that this method "is seen as an aggressive way of a deep moving horse. This is forbidden as well as any head-neck position which is obtained in an aggressive way." In a lawsuit announced on 24 August 2010, van Grunsven claimed to have been defamed by journalist Astrid Appels on the website eurodressage.com. A release posted on that website announcing the lawsuit reported that "according to Anky, images of her horses can not be connected to the controversial rollkur training method." The lawsuit was scheduled to begin 8 September 2010 in 's-Hertogenbosch but van Grunsven withdrew the case. ^ a b c d "Anky van Grunsven". Sports Reference. Retrieved 29 November 2013. ^ a b Marston, Victoria (20 May 2010). "Anky van Grunsven reveals". Horse & Hound. Retrieved 2 March 2014. ^ "Isabell Werth, Anky van Grunsven & Steffen Peters to Compete at Palm Beach Exquis World Dressage Masters". Dressage News. Retrieved 25 August 2010. ^ a b "Athletes: Anky van Grunsven: Bio". NBC Sports. 2008. Archived from the original on 3 January 2014. Retrieved 2 December 2013. ^ Warne, Sarah (28 August 2012). "Van Grunsven Winding Down After the 2012 Olympic Games". Eurodressage. Retrieved 2 December 2013. ^ White, Charlotte (26 April 2012). "Anky Van Grunsven and Salinero aim for London Olympics". Horse & Hound. Retrieved 30 November 2013. ^ a b Braddick, Kenneth J. (1 October 2010). "Anky van Grunsven is Only Rider to Compete at Every WEG". Dressage News. Retrieved 29 November 2013. ^ "From Dressage to Reining". America's Horse Daily. American Quarter Horse Association. 8 October 2013. Archived from the original on 2 December 2013. Retrieved 29 November 2013. ^ a b c "Equestrian: Anky van Grunsven". ESPN. Retrieved 1 March 2014. ^ Braddick, Kenneth J. (2012). "Anky van Grunsven on the Past, the Now and the Future – Part 1 of 2". Dressage News. Retrieved 2 December 2013. ^ Heath, Sophia (29 October 2013). "Olympic superstar Bonfire put to sleep". Horse & Hound. Retrieved 2 December 2013. ^ Bliss, Leslie (29 July 2003). "Olympics superstar Bonfire retires". Horse & Hound. Retrieved 2 December 2013. ^ "Anky van Grunsven's dressage star Salinero bows out". Horse & Hound. 18 March 2013. Retrieved 2 December 2013. ^ "Anky van Grunsven Breaks Leg". Eurodressage. 17 January 2003. Retrieved 2 December 2013. ^ "Anky van Grunsven Back in Hospital for Surgery". Eurodressage. 1 September 2003. Retrieved 2 December 2013. ^ "Anky van Grunsven Writes History by Winning Aachen Grand Prix Championship". Eurodressage. 20 July 2004. Retrieved 29 November 2013. ^ Bryant, Jennifer O. (11 August 2012). ""Rollkur": Dressage's Dirty Word". The Horse. Retrieved 29 November 2013. ^ "The Rollkur Debate Still Hot in Great Britain". Eurodressage. 20 March 2007. Retrieved 29 November 2013. ^ a b "Anky van Grunsven Sues Eurodressage". Eurodressage. 24 August 2010. Retrieved 29 November 2012. ^ Carruthers, Fiona (14 July 2012). "Cruel twist to the elite sport of dressage". Australian Financial Review. Archived from the original on 3 December 2013. Retrieved 15 December 2016. In a lawsuit launched in August 2010, Grunsven claimed she was defamed by Appels. However, she withdrew legal action in September. Wikimedia Commons has media related to Anky van Grunsven. This page was last edited on 30 July 2018, at 04:44 (UTC).